In the end Oleksandr Usyk made it look easy. Last night in Russia in dominating a very good, not to mention very tough, Murat Gassiev to win not only all four world titles at 200 pounds but also the Muhammad Ali Trophy of The World Boxing Super Series, the unbeaten Usyk proved once again how he is a legit pound-for-pound force. A gifted boxer with a superb boxing brain, the Ukrainian does not seem to have any obvious weaknesses. Not one. The question now is what next? Has Usyk, in sweeping up all the major belts, done all he possibly can as a cruiserweight? 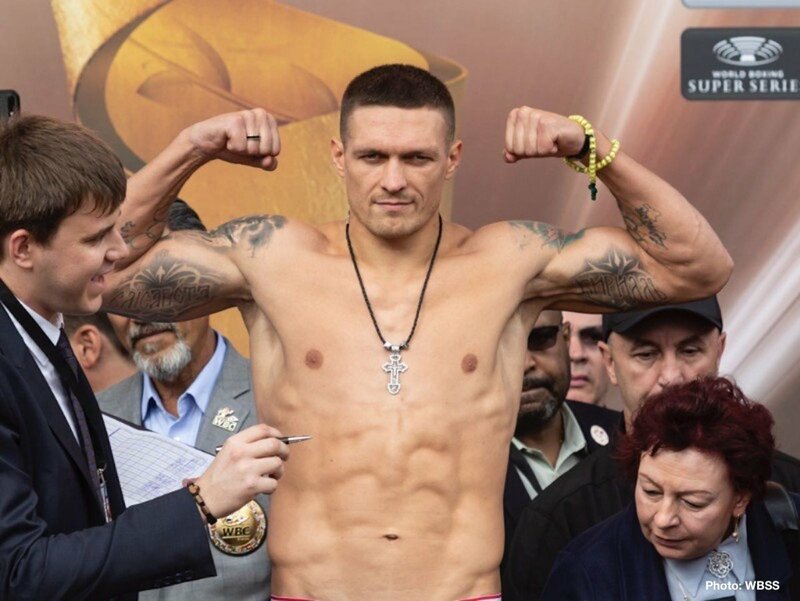 It’s pretty hard to instantly think of a big fight Usyk could take and as a result he may do what almost all cruisers do, and that is make the lucrative move up to the heavyweight division. It would be very interesting to see if Usyk could carry his package of skills up to, say, the 220 or 225 pound mark or thereabouts. Imagine, if you will, Usyk getting in there with Deontay Wilder for instance! Who would you place your money on there? One man who may get the next shot at Usyk is Tony Bellew. Bellew has said it would be a dream of his realised if he could, like Usyk did last night, make history. Bellew would become the first British boxer to win all four belts at any weight if he beat Usyk. And last night, a victorious Usyk said he is willing to accommodate Bellew – at either weight: cruiser or heavyweight. It could be a good fight, maybe even a great fight – but as exceptional as he looked last night in defusing Gassiev, Usyk would enter the ring as one big betting favourite to win. Promoter Eddie Hearn, in speaking with Sky Sports earlier today, sais talks for this very fight will begin this week. Hearn is optimistic the fight would go ahead up at heavyweight. Usyk, though, is a very special fighter and he is to be cherished. Can anyone beat him? Bellew has upset the odds before, at both cruiserweight (when he defeated Illunga Makabu to win the WBC cruiserweight title Usyk now holds) and in twice stopping David Haye up at heavyweight. But a win over Usyk would really be something else. In fact, if Bellew could actually pull it off, he would very likely earn himself a place in The Hall of Fame, as well as in the boxing history books. Let’s see if this fight can be made, and where.